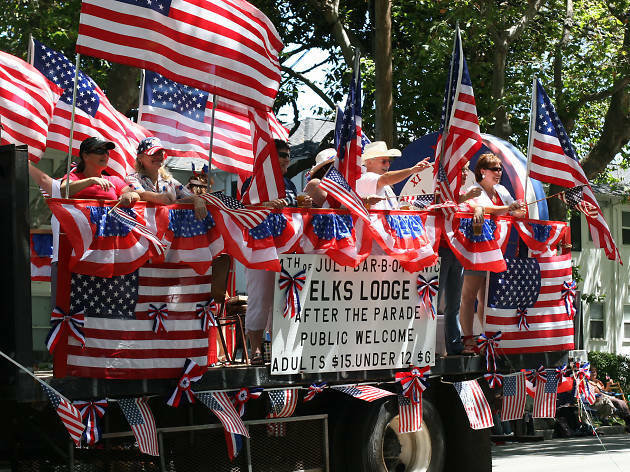 No city does Independence Day quite like San Francisco. Thanks to meteorological hurdles and a famously rebellious spirit, non-traditional events abound alongside classic fireworks displays and parades. Whether you're joining the crowds with our guide to Fisherman's Wharf or making a tour of the best ice cream in San Francisco—there's something for everyone. Spend the day at Pier 39 for what’s become the go-to firework watching party in SF. Enjoy street performers, live music and delectable bites. Fireworks will be shot off from barges at Aquatic Park and Pier 39. Tip: The walking areas next to the Franciscan Crab Restaurant offer phenomenal, usually less-crowded views of the sky. A Green, Red, White & Blue Celebration! Beards and bearded dragons go together at Albany’s 4th of July Mustache and Beard Contest. Show off your luscious facial locks at 1:40pm sharp, then peruse the purchasable reptiles, provided by East Bay Vivarium Reptile, watch the baby diaper derby, hit up the pet show and enjoy the free ice cream. Head over to the sunny side of the bay and enjoy a festive day of classic July 4th food and fun. Jack London Square will play host to upwards of 10,000 visitors, all clamoring to jam to live music, shop local vendors, get the kids’ faces painted and eat, eat, eat backyard barbecue favorites all day long. A beer and cider garden will keep things nice and chill while you wait for fireworks to kick off. Join one of the best Independence Day parties, with a fun zone for kids, live entertainment, food vendors and dragon-boat races. The fireworks explode at 9:30pm. 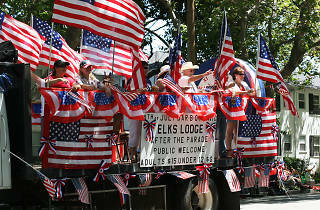 One of the longest Independence Day parades in the nation — clocking in at just over three hours — this civic event attracts 60,000 spectators to this little island. You’ll see high school marching bands, civic leaders, police and firemen — all the classics — in addition to dancing horses and quirky floats dreamed up by local businesses. When we say get there early, we mean it: neighbors start staking out primo viewing spots before dawn. Enjoy a live performance from the San Francisco Symphony at the 32nd annual Fourth of July Fireworks Spectacular. Hosted at the Shoreline Amphitheater in Mountain View, this year’s catalog will feature hero-themed tracks from the Star Wars saga, hit songs from Pixar movies, and more before culminating in a firework show over the amphitheater. If you’re proud to be an American, pay salute at the USS Hornet Sea, Air and Space Museum. This retired aircraft carrier served for three decades, seeing action in WWII, the Vietnam War, the Cold War and the recovery of the first two lunar landing space missions. The old vessel is taking it easy nowadays, hosting a 4th of July blowout that will feature live music from bluegrass, to Celtic rock, to swing jazz. Explore the ship, chow down, drink up and settle in for a fireworks spectacular. Liven up your Independence Day festivities with a little, frienldy competition. Thee Parkside hosts their first ever Lady’s Arm Wrestling tournament and Tricycle Race this Wednesday, so feel free to show off your SoulCycle and Crossfit muscles. Join CrawlSF for an evening of pub hopping in the Marina, including the Annual San Francisco Hot Dog Eating Contest. Cheer on the competitors and see who’s crowned the San Francisco Hot Dog Eating Champion for 2018. South Bay’s newest fast-casual fried chicken shop, Fowl Play, is giving away free food for an entire week. Before heading out to see the fireworks, stop in an enjoy a (free) chicken-and-waffles inspired Dipper Cone, and grab a festive 4th of July pom-pom on your way out. Here's the rest of the schedule, in case you want to stop by more than once.